Cloud visibility is one of the key areas which is deeply observed and analyzed by most of the organizations as minimizing the cost remains the primary agenda for them. Ideally, organizations require a cloud management solution to monitor, diagnose, alert and notify all the issues in your cloud infrastructure. Analyzing your AWS DynamoDB cost proves to be a vital aspect to help you understand what all resources are currently running in your cloud infrastructure and what is the cost corresponding to that. Amazon DynamoDB is a NoSQL database service which allows the creation of database tables to store and retrieve any amount of data. Data traffic of tables over multiple servers is automatically managed by DynamoDB without compromising on the performance. It also operates and scales distributed database automatically for users. Hence hardware provisioning, configuration, replication etc. is managed by AWS. DynamoDB uses synchronous replication of database across multiple data centers thus providing high durability and availability. Why visibility into your DynamoDB resources is important? DynamoDB has various product families which categorize the type of DynamoDB resources provided by AWS such as database storage, data transfer, provisioned IOPS etc. Managing DynamoDB costs becomes a tedious task when multiple line items show up on your cloud expenditure. 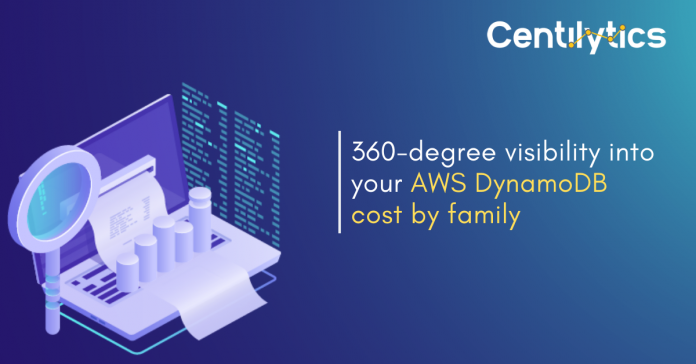 How you can analyze your AWS DynamoDB cost by family with Centilytics? Centilytics assists in providing better visibility of cloud infrastructure to their users through various insights. 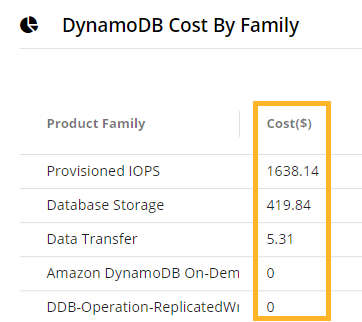 One such useful insight is that of AWS DynamoDB cost by family. 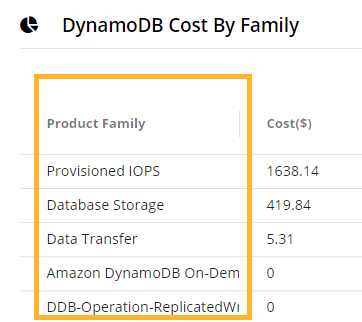 DynamoDB Cost by family insight categorizes your DynamoDB related resources currently running in your cloud infrastructure under families and shows the cost corresponding to them. Users can easily interpret their AWS DynamoDB cost by family using tabular representation or graphical(pie-chart) representation or both. Product Family: This column displays the DynamoDB product family. Product family shows the cost distribution of your total cost spent on DynamoDB related resources. It can be sorted in ascending and descending order according to the cost with just a single click. Cost: This column displays the cost (in dollars) corresponding to the product family. You can sort your cost in ascending and descending order with a just single click. A blended cost represents a unified cost that the user pays for a given service. It takes services such as S3, EC2, RDS, and several others into account. In comparison, an unblended cost represents a non-unified cost in which each type of usage with a specific rate gets its own line on the bill. Currency Selecting this filter will allow users to convert their corresponding cost from one currency to another. By default, your cost is shown in USD (US Dollars). Using this filter, your cost in USD will get converted into an equivalent cost of selected currency. For e.g. – Selecting INR from currency filter will convert your US dollar cost to Indian rupee cost. Next articleWhy is it important to analyze AWS RDS cost by family?